Peter Hill has been investigating themes that capture the visible traces of nature's ever-constant cycle of birth, growth and decay upon individual objects found in his daily life in the South West of Western Australia. This new exhibition, his first in Melbourne, centres upon the symbol of the tree as a metaphor for the inter-connectivity of life. "For many years I have observed and studied the details of trees and the natural environment within which they occur. In this exhibition I have peeled back the surface layers of these to think and feel about the underlying form of the tree and the way that this form is found in many other aspects of nature: the branches of the tree, a river delta, a network of arteries and veins or lightning in a night sky. These shared patterns are all pathways for the flow of energy". Peter's work is included in significant collections such as the Art Gallery of WA , Artbank, The Federal Court of Australia and the Kerry Stokes collection. 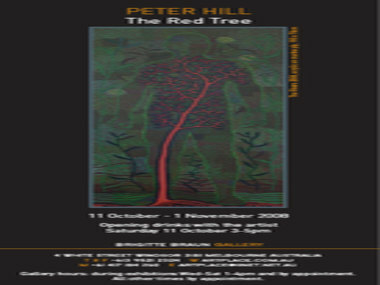 The Red Tree opens on Saturday 11 October from 3-5pm and runs until 1 November 2008. at Brigitte Braun Gallery 4 White Street Windsor. Gallery hours are Wednesday – Saturday 1 – 4 pm and by appointment. The artist will be present at the opening. For more information please call Brigitte Braun on 03 95212324 or 0417184260. The exhibition can be seen on artplace.com.au from 6 October.